Specification: Description: Increase the reliability of your system by cooling down the memory. Improve RAM performance and avoid system crash by dissipating access RAM heat. Compatible with all standard SDR/DDR SDRAM. Effective size fits all motherboard. Easy installation with spring clips. Come with conductivity thermal adhesive tape. Included:1 X PC RAM Cooling Case. Better protection and static shielding for your PC RAM. Compatible with most DDR/DDR2/DDR3/DDR4/ECC RAM models. If item is defective after 3 months, you can still send it back to us. Compatible with all standards DDR DDR2 DDR3 SDRAM. Dissipates RAM heat, improve its performance. With thermally conductive adhesive tape. Also note that monitor settings may vary from computer to computer and may distort actual colors. 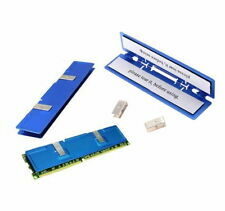 Description: Aluminum RAM Memory Heat Spreader boasts of high performance and heat dissipation effect. DDR Memory Heat Spreader increases the reliability of your system by cooling down the memory Highly improves RAM performance and avoid system crash by dissipating access RAM Heat DDR2 Memory Heat Spreader reduces the temperature of the memory module by up to 35% For the high performance over clocked system Come with high conductivity thermal pad Easy install with provided spring clips Compatible with SD memory and DDR memory Color: as photo shown. Size: L12.6 x W2.7 x H0.6cm Weight: 26.1g Package included: 1 x Memory Heat Spreader . Specification:Description:Increase the reliability of your system by cooling down the memory.Improve RAM performance and avoid system crash by dissipating access RAM heat.Compatible with all standard SDR/DDR SDRAM.Effective size fits all motherboard.Come with conductivity thermal adhesive tape. 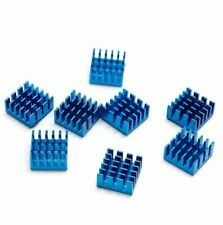 Description: Aluminum DDR DDR2 RAM Memory Heat Spreader Cooling HeatSink. DDR Memory Heat Spreader increases the reliability of your system by cooling down the memory Highly improves RAM performance and avoid system crash by dissipating access RAM Heat DDR2 Memory Heat Spreader reduces the temperature of the memory module by up to 35% For the high performance over clocked system Come with high conductivity thermal pad Easy install with provided spring clips Compatible with SD memory and DDR memory Color: as photo shown. Size: L12.6 x W2.7 x H0.6cm Weight: 26g Package included: Memory Heat Spreader x 1. Description: This high performance Memory Heat Spreader is made of aluminum for excellent heat dissipation. The Heat Spreader will protect your memory module from overheating, and the reduced operating temperature will increase the reliability and longevity of your SDR/DDR RAM. RAM Heat Spreader dissipates RAM heat improving its performance; Reduce the temperature of the memory by up to 35%; Effective size fits on all motherboards; High conductivity thermal adhesive tape; Dimension of the SDR Heat Spreader: ~12.6 x 2.6 x 0.7cm Weight: 27g Package contents: 1 x SDR RAM DDR Heat Spreader. Compatible with all standards DDR DDR2 DDR3 SDRAM. Dissipates RAM heat, improve its performance. With thermally conductive adhesive tape. Color: blue. Also note that monitor settings may vary from computer to computer and may distort actual colors. Improve RAM performance and avoid system crash by dissipating access RAM heat. 5V 4 Channel Relay. Color: Gold Tone. Type Heatsink. Material: Aluminum. New Parallel Port. Clear Acrylic Case. Compatible with all standards DDR DDR2 DDR3 SDRAM. Dissipates RAM heat, improve its performance. With thermally conductive adhesive tape. Color: gold. Also note that monitor settings may vary from computer to computer and may distort actual colors.